The Harry Potter books: Charming stories or demonic plot? The final book in the seven book Harry Potter series was released on 2007-AUG-21 in hard cover and later in paperback. The title is "Harry Potter and the Deathly Hallows." Both formats can be safely ordered at Amazon.com. There have been hints in earlier books in the series of Christian symbols and concepts. However, so many conservative Christians were noisily attacking, boycotting, and even burning the books, that few noticed. "Lewis is indeed quite intentional in his use of symbolism in Narnia. What is perhaps not as commonly known, however, is that the same type of symbolism is used in a similar book series. This series is the popular Harry Potter novels by J. K. Rowling." "This claim might seem startling, considering the reaction among many Christians to the Harry Potter novels has been almost anything but positive. From the books often topping the banned books list, to many book burnings, many Christians are completely opposed to Harry Potter and its author. Despite all of this, however, Rowling is insistent that her novels present no threat to Christianity, and many find the novels useful in discussing matters of faith. Michael Nelson writes in his article, 'Fantasia: The Gospel According to C. S. Lewis'." She’s a member of the Church of Scotland and, whenever she’s asked, says, 'I believe in God, not magic. '’ In fact, Rowling initially was afraid that if people were aware of her Christian faith, she would give away too much of what’s coming in the series. 'If I talk too freely about that,' she told a Canadian reporter, 'I think the intelligent reader -- whether ten or sixty -- will be able to guess what is coming in the books'. ..."
"In Harry Potter, one of the foremost themes is love, in the sense of sacrifice, familial ties, and friendship. The reader sees this in the loving self-sacrifice of Harry Potter’s parents for an infant Harry; Harry, Ron, and Hermione (The Trio) bear much love for each other and display this in their actions towards one another; Harry shows great love for his Godfather, Sirius Black, and Sirius returns this love in many ways, including self-sacrifice; and this similar love can be seen in Harry’s love for his teacher and friend, Albus Dumbledore, as well as Dumbledore for Harry. Similarly in Narnia, we can see this same type of love in the Pevensie children for each other, and foremost, in Aslan’s love for the children and his creation, the world of Narnia." The parallels with the torture death by the occupying Roman Army and subsequent story of resurrection of Yeshua of Nazareth (Jesus Christ) are obvious. Murphy suggests that both Jesus Christ and Harry Potter are mythical characters! He notes the degree of unease and open animosity between followers of both figures, and asks the question: "Just what is it about Harry Potter that Christians find so threatening?." 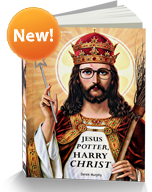 "How and why Jesus Christ, who is traditionally considered a historical figure, shares anything in common with the modern re-telling of ancient folklore that emerges in the character of Harry Potter, is the basis for my new book, Jesus Potter, Harry Christ – a 100,000 word treatise on Christian history, comparative mythology, astrological symbolism, and contemporary culture. ..."
Ellen Makkai, "SATAN: Steer clear of Potter series," Denver Post, 2001-DEC-2, Page E-05.